The last few years have been remarkable for Kangana Ranaut. After being officially crowned as the "Queen" of Bollywood in 2014, Kangana once again delivered a solid punch in 2015 with Tanu Weds Manu Retuns. And she is back again with Katti Batti to ensure that her crown remains with her, at least for one more year. Nikhil Advani, director of ‪‎Katti Batti‬, released the first look poster of the film on Twitter on Friday. 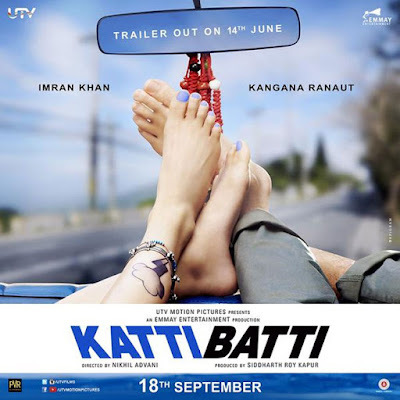 Katti Batti pairs ‪‎Kangana Ranaut‬ opposite ‪‎Imran Khan‬ for the first time. Katti Batti's first trailer has just got released with the film scheduled to release on 18th September, 2015. In the trailer, Imran Khan is seen in a rather nerdy look but Kangana is looking as glamorous as ever. It can be safely said, in almost every scene on display, she is dressed to kill. Towards the end of the trailer, we also get to see her in the sumptuous Devdas attire à la Aishwarya Rai. Although, Katti Batti is primarily being projected as a light comedy film, the trailer does allude to the possibility of some quite intense plot developments. It appears from the trailer that the duo of Kangana and Imran will be seen sharing very many intimate moments in the movie. According to reports, Kangana also donned the cinematographer's hat for the opening seven-minute-long sequence of Katti Batti at director Nikhil Advani's behest. And, fortunately, we do get a glimpse of the very scene in the trailer... and there is no denying that it promises to be sheer fun! The character played by Imran in the movie is Madhav Kabra, who is an architect by profession, while Kangana plays a free-spirited girl named Payal, who is open to flings, but not to serious relationships. Madhav, smitten with Payal, is fine with a fling as long as it brings him closer to her. So, they start a live in relationship and everything seems perfect, until one day Payal suddenly disappears, turning Madhav's life upside down. Sounds somewhat familiar? Just try and remember, Marc Webb's 500 Days of Summer! The trailer also shows a rather cheeky scene wherein an angry Payal is seen delivering a lesson on hygiene and toilette etiquette to Madhav. There are moments of immense joy and celebration of life with some camouflaged moments of pain and boredom. While it's been described as a modern day romance, the trailer doesn't rule out the possibility of a far more complex film on offer. There certainly appears more to Katti Batti than meets the eye. At 2 minutes and 58 seconds, the trailer, at first, appears to be rather long but after having watched it at least a dozen times this critic can safely say that it's quite neatly packaged. From what's on display, it can be said with some certainty that, vintage Kangana Ranaut, the audiences are up for another roller-coaster of a ride. I am eagerly awaiting it as well!